ST. GEORGE – Republican presidential candidate and Ohio Gov. John Kasich drew a standing room only crowd Saturday for a town hall meeting in St. George, where he received endorsements from local dignitaries ready to put their reputations on the line for the GOP underdog. City of St. George Mayor Jon Pike, Rep. V. Lowry Snow, R-Santa Clara, and Sen. Steve Urquhart, R-St. George, endorsed Kasich who is running behind front-runners Donald Trump and U.S. Sen. Ted Cruz of Texas. Facing off in Tuesday’s caucus, all three of the Republican candidates traveled to Utah this weekend hoping to win over the state’s 40 delegates in their bid for the White House. Kasich was the only one to visit Southern Utah. Kasich currently has 143 delegates but with Trump in the lead at 678 and Cruz trailing right behind him at 423, it’s unlikely he will be able to obtain the 1,237 benchmark needed to secure the Republican nomination. 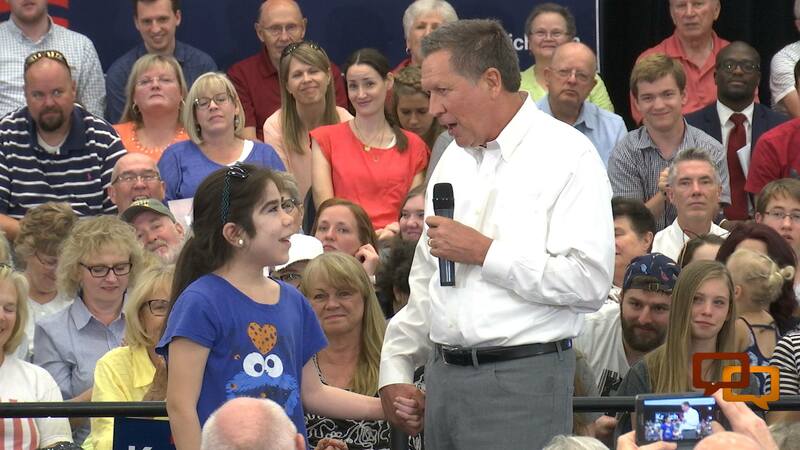 Still, Kasich isn’t backing down. “I’m not figuring on leaving anything. I’m running for president,” he said, responding to an audience member’s request the candidate not concede to his opponents. Betting his odds on a brokered convention this summer where none of the candidates has the necessary number of delegates to win, Kasich is confident he can get enough votes at that time to become the party’s nominee. In a behind-the-scenes one on one interview with St. George News, Kasich said he still believes he can win the nomination. He also said he is the only candidate who can win the November election against a Democratic candidate. Political analysts, however, argue Kasich’s bid increases the chance a Democratic candidate will go to Washington. Mitt Romney, a 2012 presidential nominee, earlier campaigned with Kasich but announced Friday he will be voting for Cruz in Tuesday’s caucus. Romney said he likes Kasich but believes, “a vote for Gov. Kasich in future contests makes it extremely likely that Trumpism would prevail.” The former Massachusetts governor has been a vocal opponent of Trump. U.S. Sen. Mike Lee has also endorsed Cruz. In an interview with St. George News, former Utah Gov. Mike Leavitt said he doesn’t believe Kasich’s bid will guarantee a Democratic win. Leavitt, while introducing Kasich at the town hall meeting, listed some of the reasons he believes the governor is the best man to go to Washington, including his willingness and ability to reach across party lines. Along those same lines, Kasich promised that if elected he would bring the country together. “I’m going to remind people we are Americans before we are anything else and we are stronger when we are together than when we are divided — period,” he said. He committed to keeping his campaign clean. Kasich is the only Republican candidate who has not taken a hard line approach on illegal immigration, but instead said he would allow those who have not committed a crime to pay a fine and stay in America. Kasich showed more of his Republican colors when he announced he would freeze all federal regulations for the first year in office, except for those affecting public health and safety. The Republican contender has been vocal in his support of giving the Western states more power over the lands now managed by federal agencies such as the Bureau of Land Management. When asked by St. George News several questions regarding public lands, Kasich admitted he wasn’t familiar with the issues but would be coordinating with local leaders and Leavitt to learn more. Moreover, Kasich would not commit to working with Congress to transfer public lands to the states, a move Utah’s Legislature has been focusing on for several years. Kasich said he did not know about the recent bill introduced by U.S. Rep. Chris Stewart that, if passed, would take away the law enforcement branch of the BLM and U.S. Fish and Wildlife Service. Prior to the town hall meeting, several local elected leaders including Urquhart, Snow, Pike and Washington County Commissioner Alan Gardner met with Kasich for a few minutes to discuss public lands issues. Forget the R’s, they’re either mean with our taxpayer money or in the case of Trump, encouraging violence. Caucus for Bernie Sanders, the only candidate who has our best interests at heart. Don’t let yourself be brainwashed by the corporate media, the Dem establishment and the Clinton machine. Let’s show them we can think for ourselves and caucus for the candidate who will tax the rich their fair share so our fellow Americans can go to the doctor and have enough to eat. Thanks! Per the IRS in 2011, the top 50 percent of all taxpayers paid 97 percent of all income taxes; the top 5 percent paid 57 percent of all income taxes; and the top 1 percent paid 35 percent of all income taxes. The bottom 50 percent paid less than 3 percent of income taxes. Making the rich pay their fair share sounds good during campaigns but bears little relationship to the reality of today’s income tax structure. Where is Bernie going to get the trillions of dollars he needs to keep his promises? Stop repeating progressive propaganda and get some facts. Sandy, don’t forget, he’s the only communist running for president. Nor that ……. chose trephination thinking it was circumcision.